This is technically a double page as the book opens up as a dramatic splash of action. 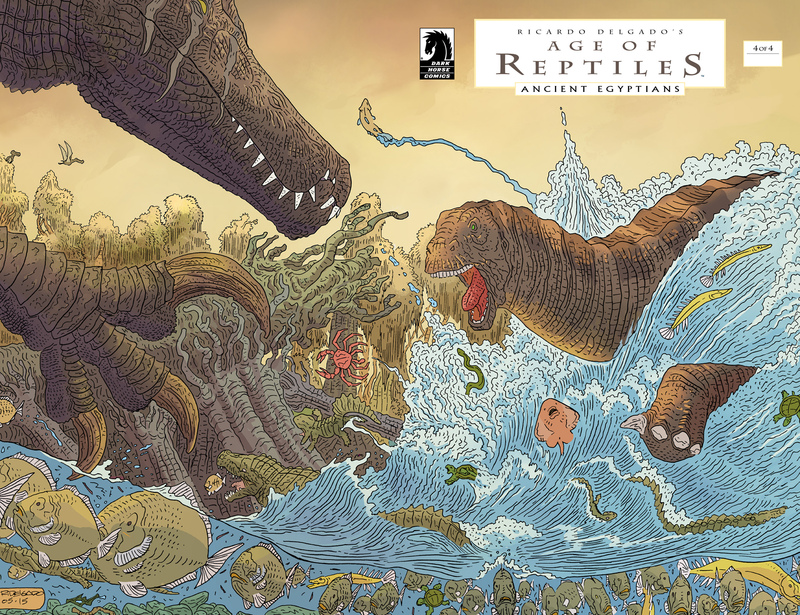 Age of Reptiles is a truly phenomenal comic because the art tells the entirety of the story. There are no words but there were none in prehistoric times either, so what you see is what happens. Delgado has a truly original line as every aspect of his art is immaculately detailed. It is not just the dinosaur leathery skin that has every crease depicted but the waves are so clear in direction. His line pattern does not change but it is the repetition and flow of the lines that provide motion. It is a topographical effect that allows the fluidity of the waves crashing around the central beast but also the rigidity in form of the shape of that very animal. It is quite a stunning piece, and you will notice this throughout the whole work. What I find incredible is that overtly detailed artwork can sometimes clutter but Delgado’s composition and colouring stop that from happening. Each creature or vegetation is completely different and that is shown in colour but the layouts also have specific functions. The colour of the crab, jellyfish and longer eel-like fish are very distinct and interrupt the seas patterns. He even uses perspective to bring out the depth to the landscape. We can very much appreciate that the scary saw toothed dinosaur is to our left and nearer to us that the one with waves crashing around him. The fish below the sea water are a great example of this because there is a clear distance involved with the larger fish nearer the aggressive beast. Finally the most impressive part of this work is the emotive expression of these animals. The sea dweller is screaming with its mouth fully aghast and its gaze firmly directed to the other. The toothed monster has his claws ready (note the detailed lines on his claws) but a more suspicious with almost a grin appearing from its jowls. The scars around the eyes show that this creature has fought before and probably won. What came first the confrontation or the water we cannot know but in any case the natural inclination of the reader is to support the more vulnerable reptile, and that is the one without the horrid toothy grin.